Athletes across Brisbane will now have access to two state-of-the-art synthetic fields with the opening of The University of Queensland’s new sporting precinct. The world-class sports facility, located next to the UQ Centre, is part of a $24 million development funded by the University, in collaboration with UQ Sport and UQ Endowment Fund. The precinct includes two multi-use synthetic fields which feature player dugouts, digital scoreboards and LED lighting. The south field is an International Hockey Federation (FIH)-accredited hockey pitch and the north field is both a FIFA 1 Star-approved soccer field and FIH-certified hockey pitch. The fields can be used for an array of sports, including hockey, soccer, touch football, lacrosse, and ultimate disc, as well as athletics sprint training. 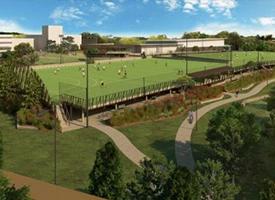 UQ Sport chief executive Bryan Pryde said the new facilities, which have been in development since mid-2014, will alleviate congestion across UQ’s playing fields, and significantly boost athlete participation numbers. “These two first-rate fields will not only benefit the UQ community and UQ sporting clubs, but also sporting groups throughout Brisbane and South East Queensland,” Mr Pryde said. “The high-quality synthetic turf is laid over shock pads to help reduce injury, and field quality will always be consistent. “The fields are more durable than grass ones, so there are no capacity issues. A total of 12 sprinklers will water and cool the playing fields, ensuring faster ball movement and reduced friction for players. The facility also features a central hub that caters to athletes, supporters and function guests. The three-storey building includes eight changing rooms, first aid and site offices, and a canteen area. The building’s top floor, known as ViewPoint, is a social space for up to 120 guests that has views of the playing fields. Completing the precinct is an eco-friendly undercover carpark with more than 500 car spaces, 350 bike racks and electric car-charging facilities. The precinct was opened at an official ceremony on Thursday 22 September.